This charming 1950s silk chiffon evening dress in cobalt blue has been beautifully constructed to haute couture standard and is in pristine vintage condition. The chiffon overlay is exquisitely tailored to showcase a sleeveless hourglass silhouette. Carefully ruched fabric is arranged in a cross over sweetheart formation over the breast beneath a sunburst of irregular pleats below the round neckline. There is a pretty appliqué rose design in blue rocaille beads and sapphire toned prong set crystal rhinestones to the left of the waistband beneath which a cascade of soft pleats falls over the length of the skirt, finishing at the calf. The ruched bolero fabric continues around the back of the dress to accentuate the waistline. There is a concealed zip fastening on the left side of the bodice. 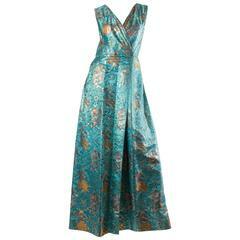 The dress has a tailored silk slip underlay also with a side zip fastening. 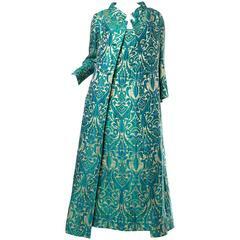 In wonderful condition with superb richness of colour, would best suit US size 6, UK size 10 to small 12. Unlabelled but British couture construction. 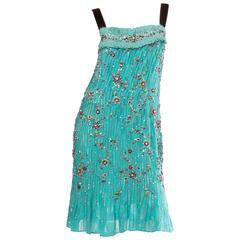 Prada Crystal Encrusted Silk Chiffon Dress. No lable however most likely Italian, Prada,?Alberta Feretti? Dolce? It feels this style and quality to us.